The ceiling of Blume, a new restaurant/bar in Rittenhouse. The space is filled with flowers. UPDATE April 23: Blume will officially open on Thursday, April 25, at 4 p.m.
Bye-bye Cinder and hello Blume. 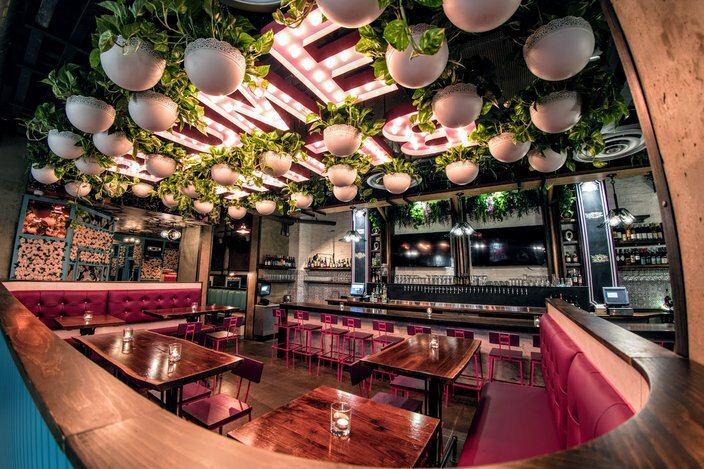 Teddy Sourias and Craft Concepts Group have announced the opening of a new food and drink concept in the Rittenhouse space that formally housed Cinder Copper & Lace, a restaurant that focused on cider, sour beer and wood-fired pizza. The owners of BRU Craft & Wurst, U-Bahn, Tradesman’s, Kontrol, Uptown Beer Garden, Finn McCool’s Ale House and Tinsel will open Blume in April. "We are aiming to create a fun, light, energetic and comfortable concept," said Sourias. 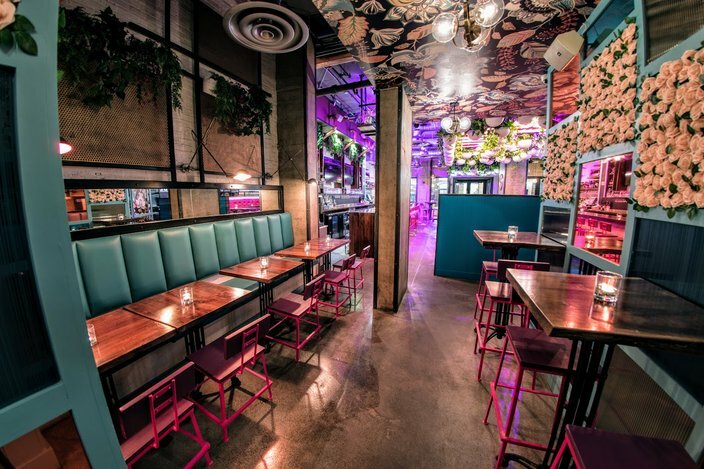 The bar will focus on cocktails and natural wine, while the kitchen will still offer wood-fired pizzas, plus lots of vegetarian and vegan options and many street food-inspired small plates. There will be 20 craft beers/ciders on taps, eight draft cocktails and four natural wines. "We believe in the simplicity and beauty of natural wine along with the fact it goes along with our love of fresh, green spaces. We handpicked approachable, easy-drinking, affordable natural wines that are delicious and promote sustainability," said Sourias. 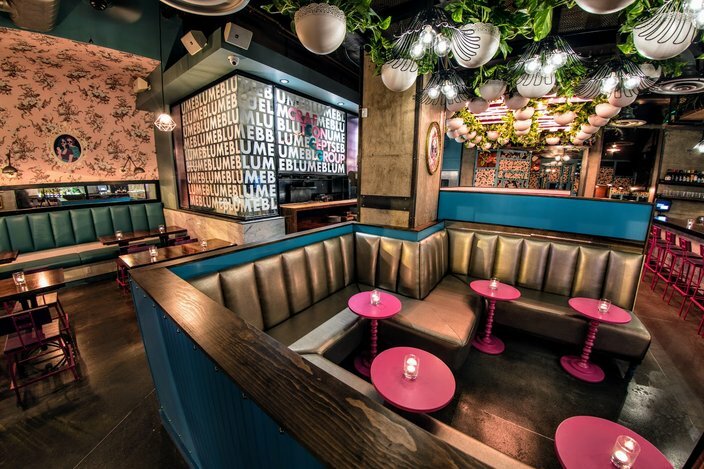 For the bar/restaurant's new look, Sourias turned to Anne White, who designed the interior of Tradesman's, the barbecue, whiskey and beer hall in Midtown Village, and Tinsel, the Christmas-themed pop-up bar. "I wanted to borrow inspiration and modernize elements from the Victorian era," said White. Specifically, she found inspiration from the era's elaborate gardens. There are 200 plants lining the ceiling, thousands of roses on the back wall, gem-colored mirrors, floral motifs, wallpaper and lots of color. Take a peek inside Blume, opening Thursday, April 25. Check out the roses on the walls. 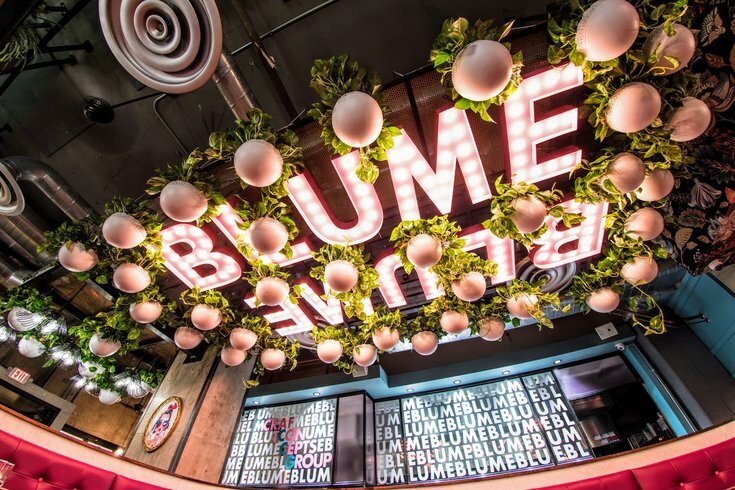 Blume's main space has banquette seating areas for both lounging and a casual dining.